Despite medication and therapy, people continue to suffer with chronic back pain. When medication isn’t working and you need a new option, a hot tub can help. The healing properties of water are well known – and highly effective. 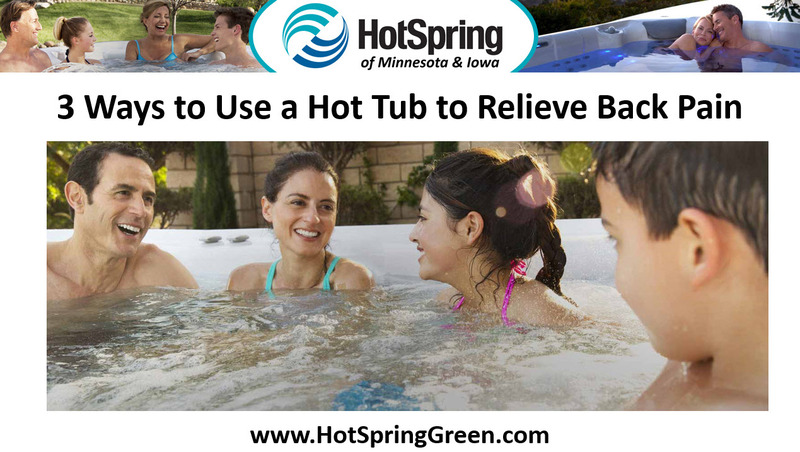 Here are three ways to use a hot tub to relieve back pain. Heat for Relaxation – Using a hot tub is an easy way to apply elevated heat to larger areas of the body at once, reaching all areas of the upper and lower back, shoulders and neck. Relief is instant, and after a few minutes, blood circulation increases, delivering nutrients to injured tissue for healing. Buoyancy For Support – Unfortunately, back pain is amplified every time we use our back muscles, increasing pain and stiffness. Soaking in a hot tub optimizes the effects of buoyancy, supporting the back and relieving pressure. Water reduces body weight by as much as 90 percent, for a soothing sensation. Massage for Pain Relief – A hot tub at home means access to on-demand relief on your time – first thing in the morning, in the afternoon or in the evening. A dip is fast, effective and safe. And with a variety of jets, a customized hot tub massage increases back flexibility and mobility, decreasing the need for anti-inflammatory drugs.